It is suitable for both positive and negative pressures. It has excellent waterproofing properties and excellent elasticity. The product exceeds the requirements of EN 1504-2 regarding concrete surface protection materials. 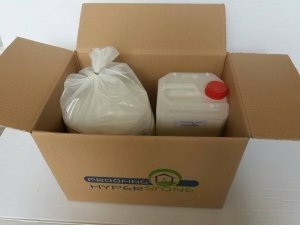 It is applied in concrete, brick, stone, AAC, plaster and on mineral base surfaces. The substrate must be stable, clean, free from oil, dirt, and debris and have its ultimate strength. Surfaces are recommended to be primed prior to application. Any imperfections, cracks and voids are covered with the appropriate repair materials. It is forbidden to apply the material to surfaces with standing water or water leaks. In case of waterproofing plastered walls for negative pressures, the plaster must be removed. The material is applied in two thin layers on the surface with a brush or coarse brush so that it penetrates all the voids. If necessary apply a third layer in the same way. The material can also be applied with a metal spatula. In this case the mixture becomes a little dense. The material is stored in closed packages and in places protected from humidity and extreme weather conditions for 12 months after the date of production.